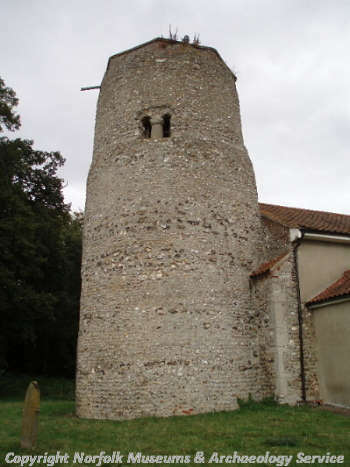 The rough and irregular flint tower is Saxon. The north and south belfry windows have exquisite balusters and the east window a Maltese cross. Two of the windows are cut from single pierced pieces of stone and were made around AD 1050 or earlier. These windows are unique. They were reset around 1100. 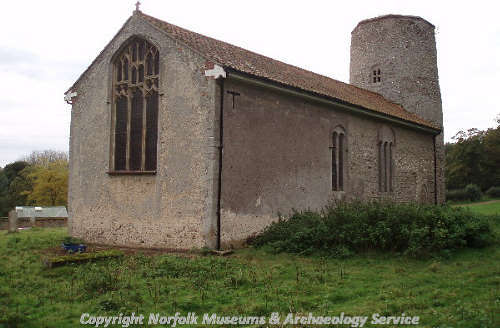 The rendered nave is probably Late Saxon but was altered around 1200 and in the 15th and 17th to 18th century. Two misericords inside the church probably come from Castle Acre Priory (NHER 4096). There is also a beautiful 20th century war memorial. The churchyard is ditched. Listed grade I for 'unique' belfry baluster shafts of around 1050 reset 1100. 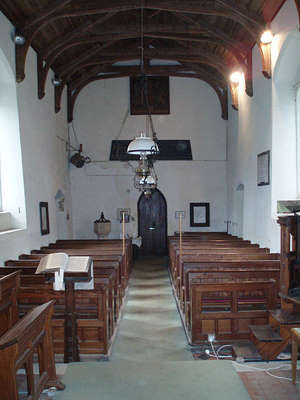 Nave Late Saxon or Saxo-Norman with additions of around 1200, 15th century, 17th to 18th century. Late Saxon and medieval sherds from yard (context 2). An information panel inside the church states that in the course of repairs in 1963, the roof of a tunnel between the church and a vault to the north was pierced. The coffins of Frederick and Louisa Keppel and two of their children were revealed, and the tunnel was resealed. At the same time the churchyard wall was rebuilt and human remains were discovered, including those of a 'young man who had been shot through the base of the skull'. D. Robertson (NLA), 27 October 2005. --- Photograph: Old photos AT32-3, Ladbrooke AP31-2. --- Aerial Photograph: TF8517 F,G,H,J,K,L. --- Serial: Blomefield, F.. 1809. An Essay Towards a Topographical History of the County of Norfolk.. Vol X. 375. --- Aerial Photograph: Edwards, D.A. (NLA). 1996. TF8616/N - P; TF8516/X. --- Monograph: Brown, G. B. 1903. Anglo-Saxon Architecture. 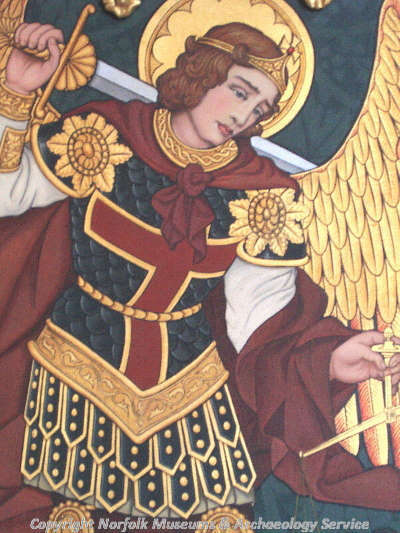 The Arts in Early England. Vol II. p 185. --- Leaflet: Richard Butler-Stoney. 1992. East Lexham. The Lanceni Press Ltd.
--- Leaflet: Richard Butler-Stoney. 1992. St. Nicholas Church, Shereford..
--- Archive: Clarke, R. R. and NCM Staff. 1933-1973. Norwich Castle Museum Record Card - Late Saxon. Lexham. <S1> Unpublished document: Rose, E.. 1978. Building Report..